This beautiful city was named after the French explorer, Robert de LaSalle, and has also been nicknamed “Zinc City” and “Little Reno”. LaSalle, IL has a big performing arts presence with performances by the Illinois Valley Symphony, as well as their annual “Jazz in the Street” Festival. LaSalle has grown from a population of just under 4000 in 1860 to almost 10,000 today. Affordability: Since the wooden materials are much more cost effective than steel, our post frame buildings will allow you to save a lot of money. Quality: Because Greiner Buildings uses only the highest quality products and equipment, our post frame buildings are guaranteed to last. Speed: Due to the construction methods and materials, we can construct your building in no time at all. Energy Efficiency: We use the best insulation on the market and our buildings are leaders in energy efficiency. Long Life: By using our expertise and the best products in the industry, you will have a Greiner Building that will last a lifetime. If you have any questions or would like more information about pole buildings in LaSalle, IL, feel free to contact Greiner Buildings today. 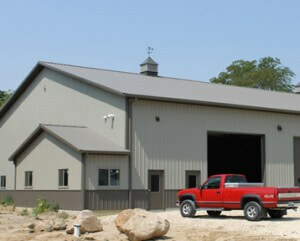 We specialize in custom design, construction, and building repair.